'Wanderlust' movie quotes, with video clips. 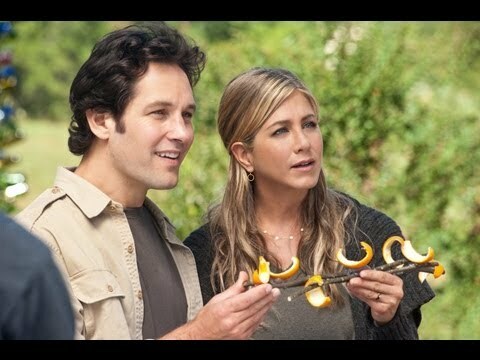 include some of the best, funniest lines from this 2012 comedy film starring Paul Rudd and Jennifer Aniston. In 'Wanderlust,' George (Rudd) and Linda (Aniston) are living the dream in New York City: great jobs, great life. But when George loses his job, they realize they have to make a change. They eventually wind up at a remote commune, where they meet an array of interesting people that make them question how they've been living. Enjoy these 'Wanderlust' quotes, and if you see a favorite, vote it up. If you know of a great quote from 'Wanderlust' that isn't on this list, add it. 'Wanderlust' is written and directed by David Wain ('Wet Hot American Summer,' 'Role Models' and the MTV sketch series 'The State'), and it reunites several members of the casts from both movies and 'The State.' 'Wanderlust' made headlines, in part, after two of it's co-stars, Jennifer Aniston and Justin Theroux, began dating. In the movie, Theroux plays Seth, a hippie who insists that the Elysium Bed and Breakfast/commune is more of an "intentional community." No, it's pretty much a commune. Can Linda and George put aside their lives in order to fit in and be happy at Elysium? And what are the best 'Wanderlust' Marisa quotes? Eva: "I know New York is a great city, but I do not miss that lifestyle at all. I mean it was just stress, and Blackberries, and sleeping pills. I used to drink a triple latte every morning just to wake up." Linda: "Well, I see your point, but I kind of value the sleeping pill and the Blackberry and the latte." Seth: "You know you can really get trapped in that web of beepers and Zenith televisions and Walkmens and discmens and floppy discs and zip drives, laser discs, answering machines and Nintendo Power Glove..."
Linda: "Wow, you know so much about technology." Seth (Justin Theroux) does seem to know an awful lot about technology (Zenith TVs aside). Think he stashed a Nintendo Power Glove in his room at the commune? George: "All these people live here. This is a commune." Seth: "We prefer 'intentional community.' We're not a bunch of hippies sitting around playing guitar." No Seth, this is a straight up commune. Plus, Seth plays guitar. A lot. Rodney: "I took our car over to town, came back around the back road and boom -- cut to: in the pond." Rodney: "I took our car to town, came back, boom, cut to: in the pond." George: "No don't cut to in the pond, don't cut!" Rodney: "I'm with you man." Rodney (Jordan Peele) can be maddening, especially when he cuts to things -- like the car getting trashed. He kind of skips over the most important parts. Linda: "I believe I can fly." George: "If you're going to get literal with an R. Kelly song, do "Trapped in the Closet..."
When Linda drinks a special tea, she starts hallucinating - climbing a tree and having all sorts of delusions, including one that she can fly.